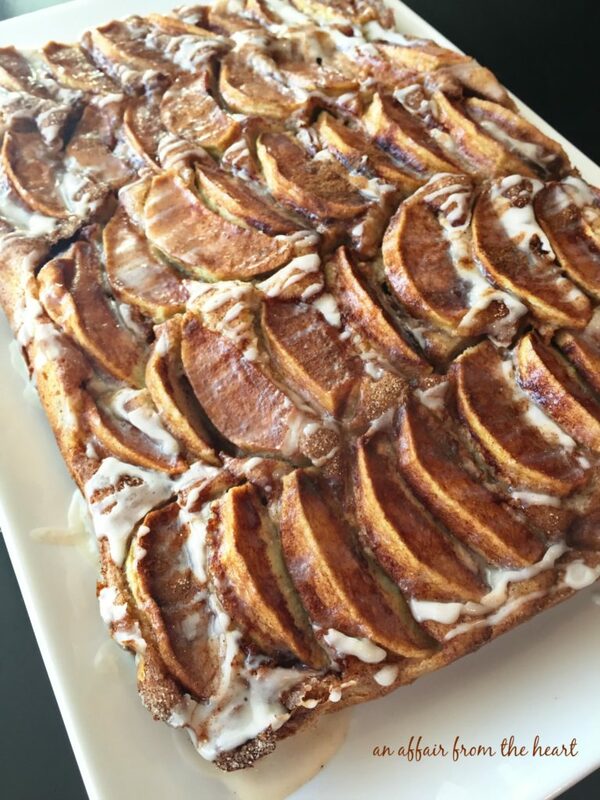 A traditional German dessert made of a ‘not too sweet’ cake, a layer of fresh apples sprinkled with cinnamon and sugar, and drizzled with vanilla glaze. Heavenly! You guys. Don’t walk, RUN to the store and get yourself the ingredients for this one. It’s simply amazing! I can’t believe it’s almost October and I hadn’t posted anything with apples yet? Typically, in my food world – September is for apples and I save the pumpkin for October – but this year I just dove right into it! This past weekend, we had a big tailgate for our Nebraska Cornhuskers football game against the Oregon Ducks. It also marked the first day of Oktoberfest and my step-dad’s birthday! We grilled Brat Burgers and I needed a dessert that was German and yummy for a birthday. 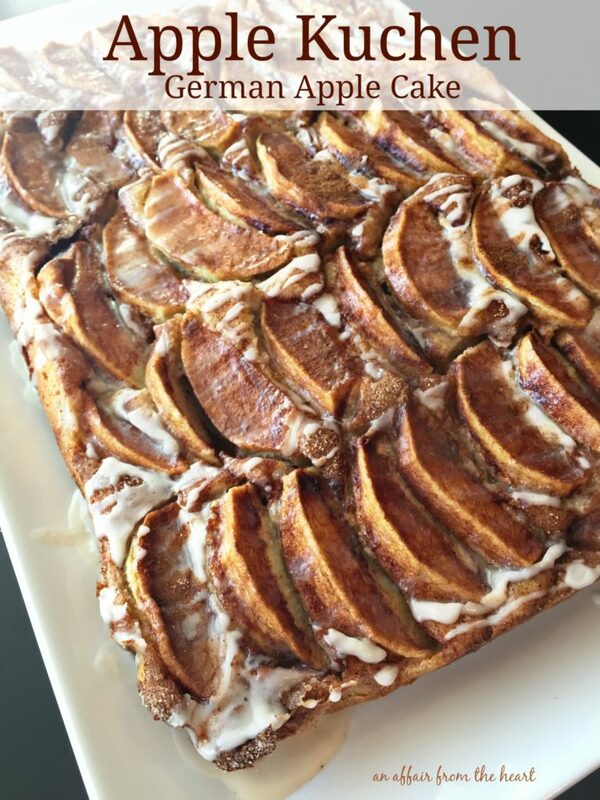 I went to pinterest and typed in “German Desserts” — lots of them popped up. Then I saw this one and clicked on it before I even realized who’s blog I was headed for. When I landed on Chocolate, Chocolate and More — I knew this recipe would be a winner, and I was right. My only regret was that it was gone too fast, and I didn’t get a picture of it sliced. But never fear, I will make this one again and make sure that happens! 😉 That’s what you call “taking one for the team.” Ha! After lining your 9×13 baking dish with parchment paper, spread the cake batter inside. 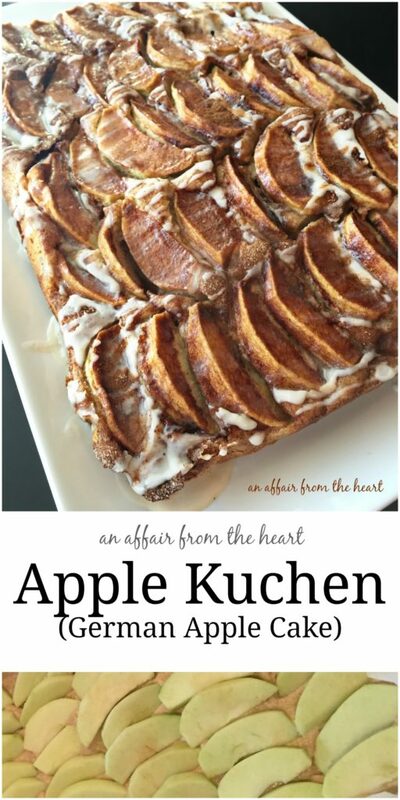 Top with thinly sliced apples and sprinkle with cinnamon and sugar. Bake and drizzle with glaze. Serve warm or cold — it’s truly amazing! 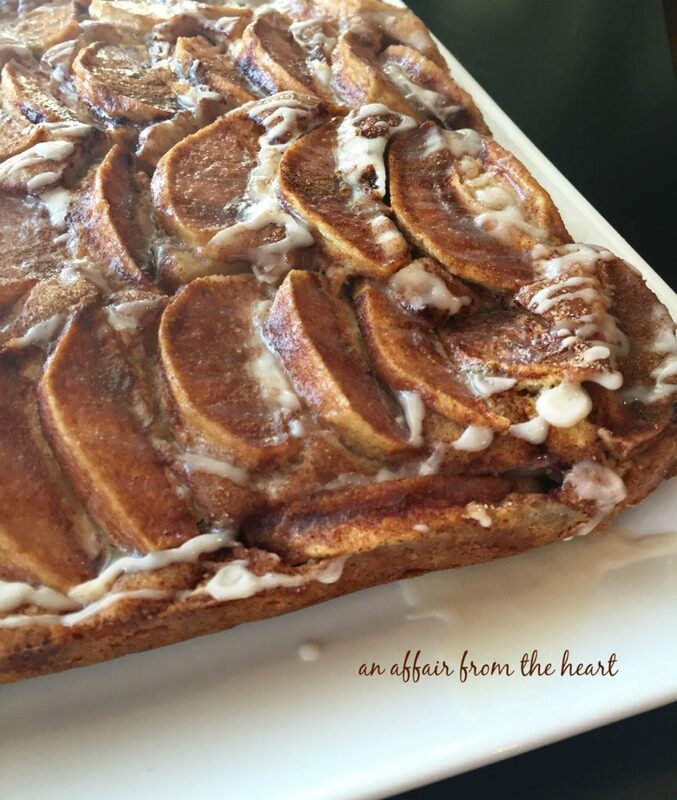 A traditional German dessert made of a 'not too sweet' cake, a layer of fresh apples sprinkled with cinnamon and sugar, and drizzled with vanilla glaze. Heavenly! Preheat oven to 350 degrees and line a 9x13 baking dish with parchment paper. Cream butter and sugar together in your mixer until light and fluffy. Add in eggs one at a time, add vanilla. Add flour mixture and sour cream, alternating, starting and ending with flour. Mixing just until each addition is incorporated into batter. Prepare glaze: combine powdered sugar, milk and vanilla, stirring until smooth. Drizzle over top of cake. Serve cake still warm or can be served cooled. Looking for other German Recipes? Here are my tried and true favorites! I really like the look of this cake. A very fun way to serve it. My mouth is WATERING! This looks absolutely amazing! Gosh, I love Fall! Thanks for another fantastic recipe my family will LOVE! This looks absolutely delicious! I am saving this recipe to try! Our 4-H Teen Cooking group made this recipe and devoured it. It was pretty simple to make and tasted excellent. We have gluten and dairy free members, so we used coconut milk, butter substitute, sour cream substitute, and a gluten-free flour mix. It turned out perfect.